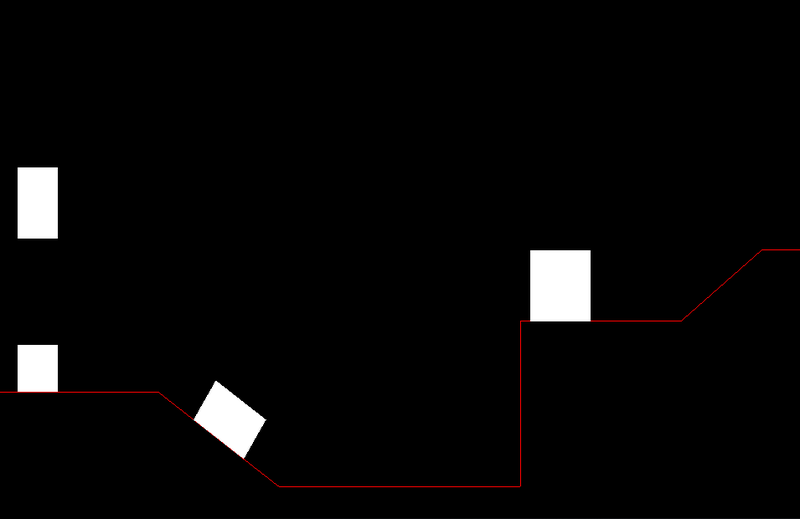 Over the last week I added rendering code for a very crude representation of the game world, using lines to draw the planet surface, and squares to render entities. I spent most of the time reading up on vertex arrays and vertex/fragment shaders, it had been a while since I last used OpenGL ES 2 for anything, and the (desktop) OpenGL code I worked on for a day-job project was actually only making things more confusing since there isn’t a fixed-function API in OpenGL ES 2, and you cannot do direct mode rendering. This means that to get anything useful to the screen in OpenGL ES 2 you have to setup your projection and model-view matrices yourself, you have to use pixel and vertex shaders, and you cannot use glBegin/glEnd to send individual vertices using glVertex3f and such, only vertex arrays or vertex buffer objects are supported. Fortunately there’s lots of OpenGL ES 2 sample code and examples to be found on the internet, and in addition to that I had a hard-copy of the official OpenGL ES 2 Programming Guide lying around, so with a few hours of self-study I got confident enough to hack up some rendering code. So how do we start? Well, getting a reference to the K14Planet instance from the view controller, obviously, iterating its surface edges to setup a vertex array and drawing them as a line loop, then iterating over all entities and drawing something for each of them. Sounds easy enough right? Not so fast! What if at some point in the future, for reasons beyond the scope of this post (I’ll get back to this subject later), we want to run the render loop on a separate thread? If the thread the game and physics update runs would modify some part of the game state that is also being accessed by the render thread, mayhem would ensue. The solution to this (possible, future) problem is relatively straightforward: just don’t access the game state (planet, entities) directly from the renderer. Instead, after each game update, create a read-only carbon-copy of just the subset of game state that is required for rendering, and make sure the renderer gets exclusive access to this snapshot when it starts rendering a frame, for example using a single-slot queue. Any time the renderer grabs the snapshot it retains a reference to it that persists for as long as the renderer takes to render the frame. In the mean time, the game update thread may update game state, create a new snapshot, and replace the one in the single-slot queue. This means that at any point in time there could be two ‘live’ snapshots: one that is being rendered, and one that’s ready to be rendered. This is why this technique is sometimes called ‘double buffered game state’. I implemented basically exactly what’s described in the previous paragraph, using 2 new classes K14PlanetSnapshot and K14EntitySnapshot. Any time the K14Planet step selector is called to update the physics simulation and call K14Entity step for all active entities, a snapshot of a subset of the planet and entities is made, and assigned to an atomic property snapshot, which is what the K14GLES2Renderer reads every time it renders a frame. Over the next week I will be working on rudimentary interfaces for input handling, to be able to simulate user inputs (thrust, rotate) and have the ship react to them. The total development time (excluding research) is now about 12 hours. The SLOC count for the complete project (excluding Box2D) is 352.